Are your ‘family day out’ suggestions met with lethargic groans and cynicism? Do you need of some cool new ideas? We have exactly what you need to boost your parental arsenal, The Family Super Stand Up Paddle tour. What is our family Super SUP activity? This unforgettable experience is action packed, adrenaline filled and sure to have you back in the cool-parent category. The Super SUP tour is our latest and possibly most fun family holiday boredom buster. Mum, dad, and kids will be kitted out in a top of the range wetsuit, buoyancy aid, helmet and paddle then join one of our experienced instructors to paddle this giant surfboard along our breath-taking Cornish coastline. Along the way you’ll take in secret coves, smugglers’ tunnels and interesting marine life that make these craggy cliffs their home. After some exploration, you’ll drop anchor and play a range of hilarious family games (King of the SUP, Sumo SUP, Drunken Sailor and SUP racing) before throwing any family feuds to one side and working together to knee paddle, then stand up paddle as a team along the coast. In addition to the sure-fire laughter and exploration, the family Super SUP offers a balance of physical activity, team spiritedness and education. 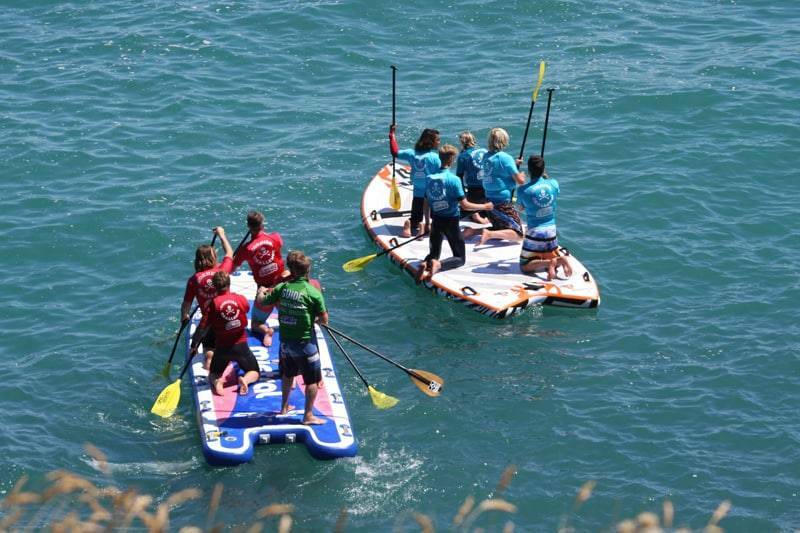 By the end of the session you and your children will have learnt how to kneel and SUP paddle as a team, safely navigate the Newquay coast and identify local marine life such as crabs, seals, seabirds and dolphins. Our expert team of qualified instructors instil ocean safety lessons and will ignite a healthy interest and appreciation in the ocean and its environment.